Announcing RIFIDI® 3.6 Release –Key Feature: ALE Implementation – Further Connecting the Internet of Things with People. Transcends – Connecting the Internet of Things with People (Web, Cloud, Big Data, Analytics, Mobility) Enabling Smarter Sensors. Smarter Applications. Simpler Solutions. Transcends is proud to announce the RIFIDI® 3.6 public release, further “Connecting the Internet of Things (IoT) with People”. This release was made possible through client implementations, the RIFIDI open source community feedback, surveys, forums and our dedicated global engineering team. The key focus of this release is to include the Application Level Events (ALE) GS1 standards as part of the Rifidi Edge Platform. ALE provides a simple web service based interface for defining business events through pure configuration (no coding required) hiding many of the lower level details. An example implementation of this could be defining reader 1 and antenna 1 to 4 (of a 32 antenna reader) as a logic representation of the back dock door. Then subscribe to the logical reader definition to receive all tags arriving at the back dock door within a 10 second period of time and deliver the message to a MQTT message topic. Another key feature of the release is extending the monitoring features by publishing real-time sensor and Rifidi application state changes to a MQTT message topic (with configurable end points). An example could be notifying in real-time that a sensor has disconnected which may mean the sensor has lost connectivity, hardware and/or network issues have occurred via a MQTT message. Generic Adapter update – Included a REST interface for easier Rifidi event processing integration with any smartphone, reader and/or device that supports REST. REST – Added JSON plugin support. RFID technology is frequently promoted as a process advantage which can revolutionize supply chain logistics. In the pharmaceutical industry, applications for RFID include track-and-trace and ePedigree systems, where RFID offers feature-rich electronic tracking. 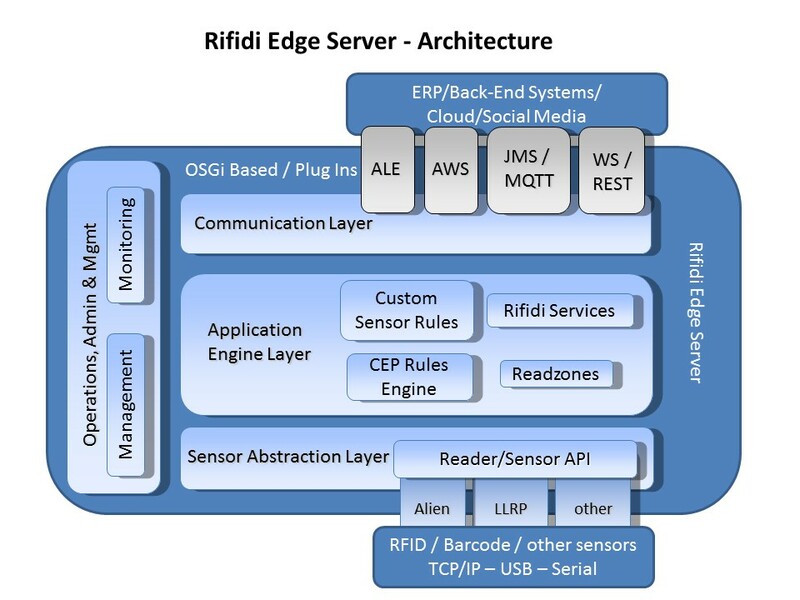 At PMRS, the promise of RFID’s competitive advantage has been realized through integration with the RIFIDI Edge Server. To enable facility-wide RFID tracking, PMRS has created more than 50 RFID readzones at key processing and storage locations using over 200 RFID antennas. All materials are tracked using a unique EPC, integrated in a printable smart label generated by Zebra RFID printers. RIFIDI serves to provide advanced tag processing, such as RSSI filtering and readzone management, to supplement existing location-based business rules. By using RIFIDI to interface with this RFID infrastructure, PMRS has seamlessly integrated RFID tag detection with existing inventory management systems. The location of all materials, from in-process to finished product, is automatically updated to reflect each object’s physical position in real-time as communicated by the RIFIDI Edge Server. This has enabled PMRS to offer significantly improved accuracy, efficiency, and visibility of vital business processes. PMRS, Inc. is a full service ISO 9001, ISO 14001, ISO 27001 registered contract manufacturer of pharmaceutical products, handling everything from clinical supply and commercial scale manufacturing to warehousing and distribution. Transcends constantly improves, updates and enhances our robust, open source Rifidi product to better meet users’ needs. Candidate features for our next release, based on feedback from clients, community, projects, forums, collaborations and partnerships, include the following. Accelerate your IoT adoption with RIFIDI®. Connect your RFID reader and sensor network. Analyze you sensor information in real-time and over time. Optimize your business processes. Integrate with the enterprise. Differentiate your products, solutions and organization. By utilizing the Power of RIFIDI®, the possibilities are boundless across many verticals (retail, healthcare, transportation, manufacturing, recreational) from global enterprises to local small and medium sized businesses. Thank you for all the contributions and support. We look forward to continuing to work with the RFID community to bring innovative, valuable business solutions to the market. December 2015 – Transcends Announcing RIFIDI® 3.4 Release – Connecting the Internet of Things with People. http://transcends.co/wp-content/uploads/2015/08/transcends-final.png 0 0 Brian Pause http://transcends.co/wp-content/uploads/2015/08/transcends-final.png Brian Pause2017-01-11 14:02:252017-01-11 14:02:25Announcing RIFIDI® 3.6 Release –Key Feature: ALE Implementation - Further Connecting the Internet of Things with People.